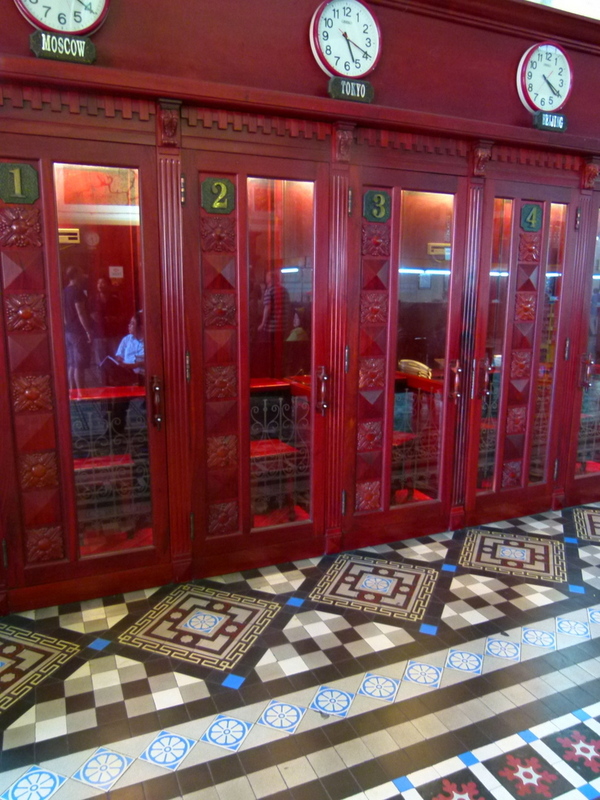 The Saigon Central Post Office is a reminder of what post offices used to be like. The building was designed by Gustave Eiffel, the same guy who designed the Eiffel Tower in Paris. No wonder I have to remind myself that I’m in South East Asia, not Europe when I visit. The official address is Number 2, Paris Commune Street and it’s directly across the road from the beautiful Notre Dame Cathedral. Built between 1886 and 1991, the building is Neoclassical Architecture at its finest, according to some reviewers, and mixes Gothic Renaissance with a strong French influence. The building is in superb condition and looks a little bit like a European train station with its huge clock displayed on the front and solid wrought iron fence. The exterior is picture postcard perfect with just enough “wedding cake” features in pink and white to make it beautiful with being kitsch. Along with Notre Dame across the road, it’s a huge favourite for wedding photos and you can see couple posing out the front on any day of the week. As you enter the grand interior you are struck by a huge sense of space. The symmetric, arched, ceiling is massively high and is supported by two rows of steel pillars. Grand and stable, the ceiling bears the mark of its famous designer. The big, airy interior still feels as though there is plenty of space, even when it’s seething with people and activity. At the far end Uncle Ho (Ho Chi Minh) watches benevolently over the activity below. The arched windows, sweeping corridors, ornate furnishings and a gorgeous tiled floor complete the picture. Two maps hang on opposite walls. The first is “Telegraphic lines of Southern Vietnam and Cambodia in 1892”, the second “Saigon and its environment in 1892.” Both remind visitors of days gone by. One of the very special highlights in the post office is Mr Duong Van Ngo, who sits serenely at the far end of the building, peering through a large magnifying glass under a sign reading “Information and Writing Assistance.” He’s been working for the post office since he was 17 and has been a writer and translator in four languages for over 25 years. He is the last official letter writer in Ho Chi Minh City and its mind boggling to think how many people he has connected across the world with his pen. After the war, many Vietnamese people fled to set up communities around the world. Many of those left behind may not have been able to read or write and this service would have been essential for them to keep in contact and receive news from friends and relatives. It’s sometimes hard to believe that the Saigon Central Post Office is still a working entity. Sure you can just wander in, have a meander around and take some cool pictures but, you can actually DO STUFF while you are there as well. Here’s a few suggestions. The old phone booths now house modern technology and you can make international calls from a modern phone or withdraw money from an ATM. There are plenty of seats around the building. Why not buy a postcard from the large range available and take a rest to write them out? Just wander down to the service counters when you are finished to buy your stamps and send. It’s also a great place to ship home all that excess baggage and souvenirs you’ve been buying. Rates are reasonable and we’ve never had any trouble receiving them at the other end. English is spoken by some staff. Buy from a large selection of individual stamps and collectors packages. 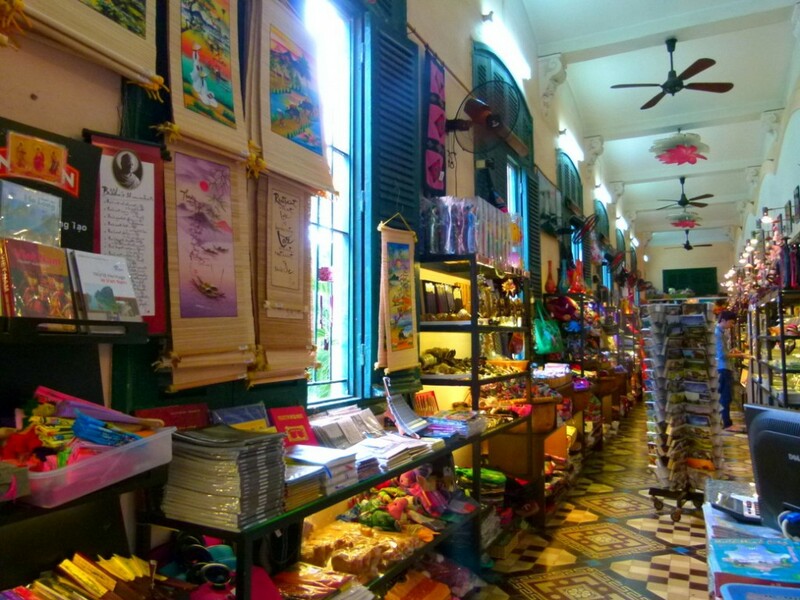 Shop from a selection of souvenir stalls with prices better than nearby tourist markets. You can still bargain remember. Buy discounted theatre tickets or book tours from the Information counter on the left as you walk in. 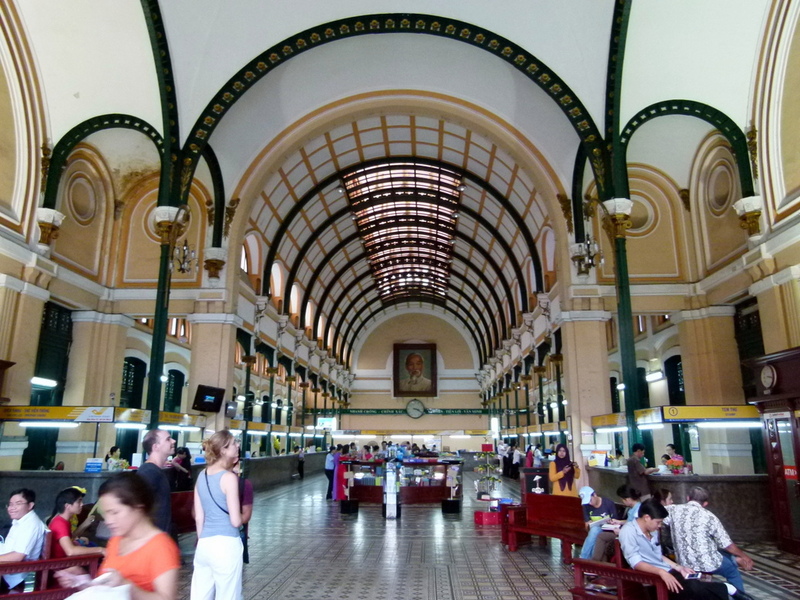 So, if you are on a guided tour or just walking around Ho Chi Minh City by yourself, the Saigon Central Post Office is definitely worth a visit. There’s plenty of history and atmosphere to soak up and more than enough picture opportunities for at least 10 minutes of your time. More if you avail yourself of the services available. The building is open between 7am to 7pm weekdays and 7am to 6 pm weekends.